This is the Kona brought to you by Dillanos Coffee Roasters. 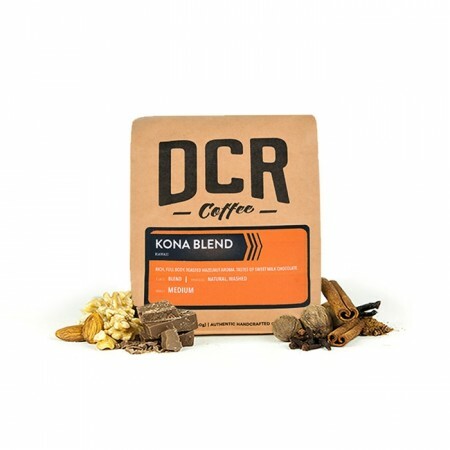 With coffee from the region of Kona in Hawain and other Pacific Islands this blend, it is smooth and rich, this cup has a buttery texture, notes of roasted nuts and a sweet milk chocolate finish. ALMOST a 5 star...just barely missing something that makes you go "whoa!" after each sip. A good blend, and great roast. Close to my #1. I very much enjoyed the sweetness, nuttiness, and creaminess of this bean. These attributes were initially muted as I was using water with a very high mineral content. Once I made the necessary water adjustments (TDS at about 100), it came out delicious. I would say that this coffee sits perfectly within my flavor profile. Good Kona Blend. Nice change as Kona has a unique taste. I loved this coffee. Usually I prefer darker roasts, but this Kona was amazing. We really enjoyed this. Perhaps the dark roast we thought we'd loved is only because we'd had bad coffee? If there are similar medium-roast coffees, we'd be happy to try them too. I was not at all a fan of this one. It was too light a roast. Loved it. So many of the coffees I've been using has a watery experience. This Kona blend truly fills the entire sip - for the entire cup. Great taste. Present but no bite. and not overly tick. Smooth with a thinness to it. Surprisingly good. Could stand to be a little more roasty, but there's nothing acidic, sharp or unpleasant about it. Strong and solid, a good morning boost. Hearty. The coffee had a nice flavor but was a little bit "softer" than we would like. Looking for something with a bolder flavor. Very smooth when done properly. Prefer something less nutty, and the floral notes were subtle. Eh, it was alright. Definitely not bad, but not what I was hoping. Kinda tough to put this in words. The bean was the same color I prefer. Next time, I'd like to try a single origin. This blend has been difficult for us to brew, it just never seems to turn out and the flavor seems off. The nutty notes are a little too much and there seems to be some undesired bitterness in the finish (although could be the difficulty with brewing). I didn't like this one as much as last month's 24th St. Blend. Some of the times I brewed it were better than others, but the most recent one was especially bitter. Good but not great. Would drink again, but doesn't hit the high bar that 24th Street Blend did. I LOVED THIS! I could drink this blend daily. It was rich and something to savor. Great quality! It makes a good, strong cup of coffee. A great morning before work kind with great flavor. Really happy with this one in the chemex. These beans are not bad, I just had a hard time picking up any distinguishing notes or characteristics. I tend to prefer a more nuanced cup. This was ok, but a bit too light for us. The light roasts seem a bit astringent. we really liked this one. great flavor, not bitter. not PERFECT (otherwise it would have 5 stars and we would be done searching!) but the best one from Mistobox yet. This roast was really good! I would enjoy another one similar to this one, maybe with some sweeter notes to it? Yum! Liked this one a lot - rich and nutty describe this coffee perfectly. Would definitely buy! I liked this coffee a lot. It has a smooth nutty finish and is very drinkable. Was darker /more bitter than I tend to like. Similar finish to French Roast. What a smooth cup! Very balanced, low acidity, and overall a pleasant cup of coffee for whenever you need a quick pick-me-up! We love Kona! Just the right amount of everything. This coffee was more delicious than I anticipated. It was strong the way I like. I felt like I was hovering over my chair rather than sitting in it all day. Love it!